Seven of the eight retired nuclear scientists, who had voiced their concerns over certain aspects of the Indo-US nuclear deal on August 14, today met Prime Minister Manmohan Singh and reiterated their fears. 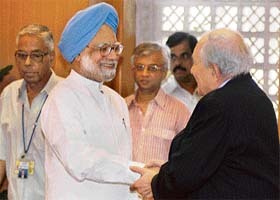 Prime Minister Manmohan Singh shakes hands with former Atomic Energy Commission (AEC) Chairman H.N. Sethna as National Security Adviser M.K. Narayanan walks past prior to a meeting in New Delhi on Saturday. The Comptroller and Auditor General of India has rapped the Punjab Government for misappropriating Rs 934.53 crore collected as rural development cess during 2001-05. The findings of the CAG has come at an inappropriate time for the Congress-led Amarinder Singh government in Punjab as the Assembly elections in the state are due to be held in February next year. The Assembly elections in Uttar Pradesh, Uttaranchal, Punjab and Manipur will be held before March 17 next year, Chief Election Commissioner N. Gopalaswamy said today. Briefing mediapersons after a meeting with Uttaranchal Chief Election Commissioner N. Ravishankar and the District Magistrates here. Describing Kashmir as an “intricate issue with different dimensions”, senior PDP leader Tariq Hameed Qarrah here today advocated dialogue with militants, excluding foreigners, to find an everlasting and amicable solution to the problem in Jammu and Kashmir. The Mr Justice K.K. Gupta Commission today gave a clean chit to the Shri Amarnath Shrine Board, headed by Governor S.K. Sinha, in the controversy surrounding the formation of a man-made Shivlingam at the cave shrine of Amarnath in Kashmir. What Hair has just done is make himself a laughing stock. It weakens his case considerably because it smacks of somebody just interested in money. A team of the Bihar Police today came here to arrest controversial RJD MP Sadhu Yadav in connection with an assault case but failed to find him, two days after he was involved in a high-voltage drama in the Lok Sabha. The Netherlands' Government today communicated its response to the detention of 12 Indian Muslims, but there was still no apology. Instead, The Hague justified its action by sticking to its "suspicious behaviour" line of argument and maintained that this kind of behaviour "appeared to require urgent preventive action". Over 11 years after injuries sustained during training at the Indian Military Academy left him completely paralysed the chest downwards, ex-cadet Navin Gulia was awarded benefits due and consequential relief yesterday.